Any physical building in your landscaping can be known as a Hardscape, and we can build it for you. 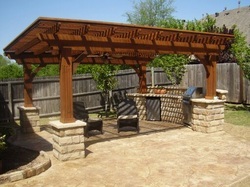 From Decks to Pergolas, Boerne Deck Builder is eager to serve all of your Hardscape needs! We take pride in making your Backyard Dreams a Reality! With our Creative and Innovative Contractors, we are sure to come up with a design to knock your socks off! Already have a design in mind? We want to take that design off paper and put it in your Backyard! Our Contractors are ready and eager to give your home that WOW factor you have been waiting for! Using only the best tools and supplies, we know your yard will be the envy of the neighborhood! No job is too big or too small! From Installing a set of Stairs to Building a Pool Deck that will make your jaw drop, we build to impress! We survive on customer satisfaction, so if you aren't satisfied, we aren't either! Give us a Call TODAY and get one step closer to making your dreams a reality. Or just Fill out the Form on the Right! We look forward to hearing from you!